Let your imagination take flight into space! Let your imagination take flight into space with bright shining stars that GLOW in the dark. 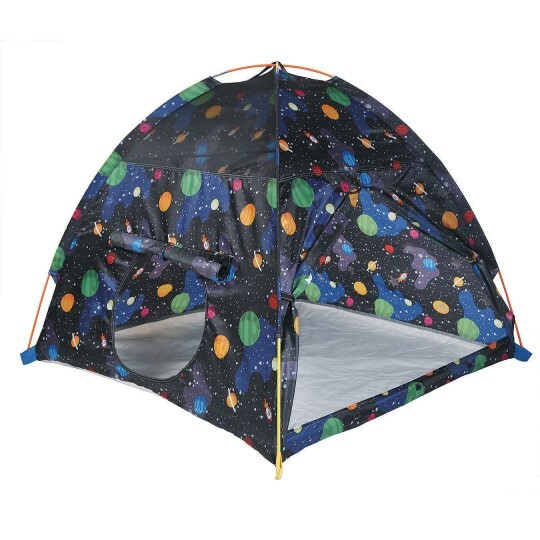 This durable, kid-friendly tent makes playing in a dark environment a true sensory stimulating experience. Features a mesh panel on the top for ventilation, a tunnel port with a flap that closes with Velcro® when not being used, and a waterproof floor. Can comfortably sleep up to 3 children and sets up in about 2-3 minutes. Measures 48”W x 48”L x 42”H.